This is the original version from a digital photo I took of my acrylic painting of a real dream I had as a child. 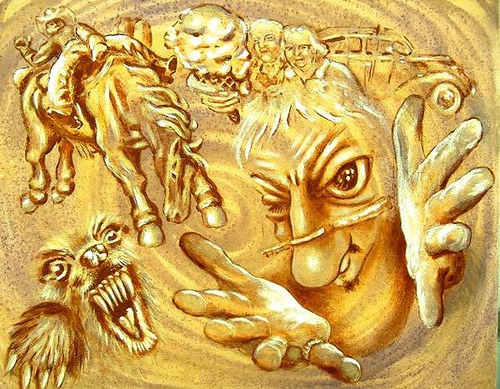 I used salt and pepper in thinned liquid yellow and violet paint in squirt bottles to simulate dust swirling and painted in white and ochre and burnt sienna and burnt umber. 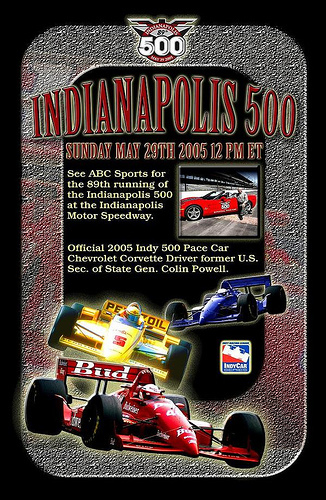 I created this Indy 500 poster design using the two given logos and a cd of given photos of many cars to choose from one of which we were to change colors. I took the red car and made it blue after reversing it, shrinking it, and removing the lettering using cloning technique. I also created the flying dust effect (noise). 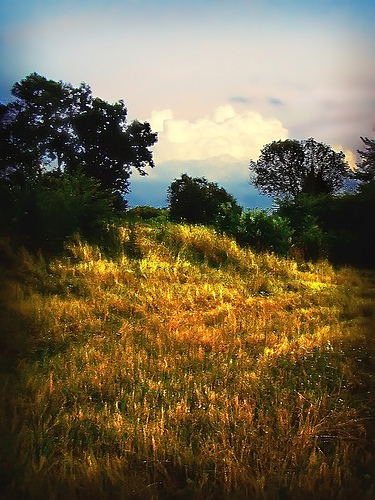 And I gave a whisper image to the asphalt looking texture track. We were told what information to include. I have started a project of scanning many old film negatives. This is slow work. I do an image then photoshop all the dust out from 2-4 hours each. I think the images will look better then when I first did them 20 odd years ago. I Don’t know if I will print any. This has been fun to get going on this. I think photography is a great way to time travel to the past. Im thinking of so many fun things I use to do. The photo is only about a 10th of what really happens when making them. I wish I could put all the stories of what happened to make each set I ever did. The stories would be long and funny or crazy. But I will just tell a small amount. Im not so good at writing about things. Jerry Uelsmann is my most favorite photographer. As I started my collage work I hoped to do images like he did. I found this to be a challenge. I needed to use a lot of photo paper to try things out. I did not have the money that this would take so I slowly stopped trying to do some things like he did. I had a hard time thinking of what I would do that would be my thing in that kinda image. So I did a few not all the good looking. But I still love the images Jerry Uelsmann has. He still has images better then ones from photoshop. 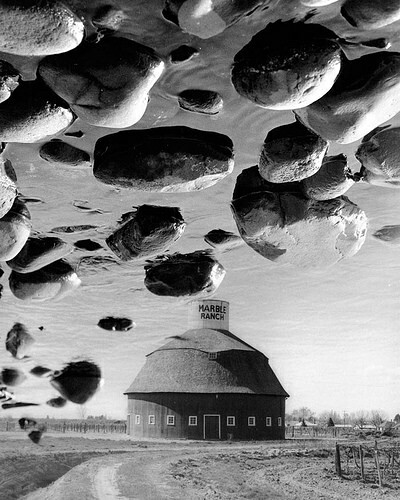 The Marble Ranch Round Barn if in my home town I lived in as a kid. So I had seen it all my life always like to look at it. So I did a photo one day then I was at a river found some cool rocks then as I looked at my images I found that I could put the to in to one image. In photo I was hoping to have a storm of rocks moving in to the sky. This was printed from two negatives on to one paper. I scanned the 8×10 print. I only did resize in photoshop. It has so much dust I did not care to spot it all out sorry for that. I do have three real prints. So this is just to make a record of things I did back in the old days. I did this in 1987 no computer was used to make this. Images from a 35mm camera.